Hinjewadi hosts #WowVenue Verified Venues, ranging in capacity from , and priced between . There are Banquet Halls in Hinjewadi. Hinjewadi features Small Banquet Halls and Large Banquet Halls that are ideal Venues for Private Parties, and AC Banquet Halls and Hotel Banquets that are perfect Venues for Weddings. Top Banquet Halls in are . Banquet Halls in Hinjewadi have a capacity range of , and a varied price range from , depending upon the location and type of Venue. Hinjewadi harbours some of the Best Luxury Banquet Halls too, such as . Hinjewadi features Popular 5 Star Hotels like . These Venues offer Lawns + Banquet Halls, ranging in capacity from , and priced between . WOW Venue’s Recommended 5 Star Hotels in Hinjewadi like allow Indoor & Outdoor Catering, Cocktails & Hard Liquor, and Outdoor Music too. These are excellent for any kind of event - be it Weddings, Conferences, Receptions, or Birthday Parties. Resto-bars and Lounges are perfect Venues for Outdoor Parties and Cocktail Parties. Hinjewadi houses some of the Top Lounges and Rooftop Venues like , ranging in capacity from , costing between INR . From Budget-friendly #WowVenues in Hinjewadi to Premium Luxury #WowVenues in Hinjewadi, avail up to 30% off on the venue of your choice at WOW Venue! BOOK NOW! Ideally situated right off the Mumbai-Pune Expressway in the vibrant Hinjewadi district within close proximity of the widely considered city's IT hub. 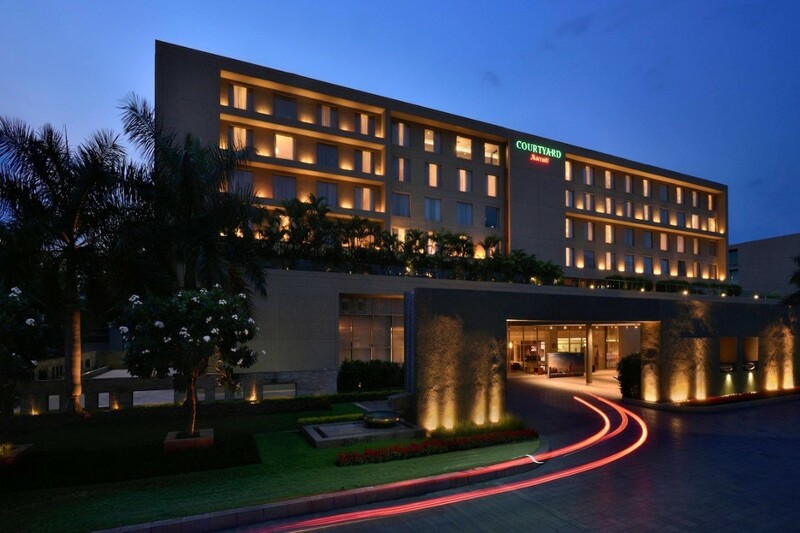 Courtyard by Marriott Pune Hinjewadi is pleased to provide a seamless blend of refined luxury and functional convenience, as well as award-winning service. Spread across 9,440 sq ft of total meeting space, the banquet rooms are the ideal place for a corporate event, a fashion show, a social do, cocktail party In Pune or a wedding. It is an ideal spot to make all wedding dreams a reality, as one of the wedding venues in Hinjewadi. Perfect for weddings as a marriage venue in Hinjewadi, receptions and social events. The extensive party area can be used perfectly to execute any special day for social to family wedding occasion In Pune. This Hinjewadi Banquet Halls can be combined and detached depending on the size and capacity of the event. The meeting and conference spaces at the hotel are ideal to host business conferences, team get-togethers, product launches, social events and other such multi-faceted events in style. At Courtyard by Marriott, Pune Hinjewadi, they have one of the finest boardrooms (Baithak) fully equipped with the latest audio-visual equipment to meet all requirements. Their largest banquet hall is Aangan which opens up to an impressive courtyard, and is perfect for meeting break-outs and theme breaks, accommodating up to 800 guests.